When Alexis de Tocqueville visited the United States during 1831 and 1832, he was struck by the fact that the young republic had no overpowering metropolis, that “the intelligence and the power of the people are disseminated through all the parts of this vast country.” While New York City was the hotbed of innovative newspapering, much of that innovation was in the service of disseminating the news to the broadest possible audience. The New York Sun, established by Benjamin Day in 1833, led the field in innovation. Eager to sell papers during a severe banking crisis, Day priced the Sun at one penny and outsold his rivals. He hired reporters rather than relying on his readers for news, as had been the common practice. But it was the far-sighted business plan of his successor, Moses Yale Beach, which would truly revolutionize the distribution of news. Thus was born the Associated Press, a uniquely American institution, at once a business and a public trust. In structure, it is a not-for-profit cooperative, engaged in gathering with “economy and efficiency an accurate and impartial report of the news” for its newspaper members. Where other countries have established state news agencies to address the costly challenge of gathering and distributing news from near and afar, in America it took ferocious competitors coming together to share the financial and logistical burdens associated with informing the public. Because this effort by newspaper publishers was aimed at reporting on the government’s war against another nation, as opposed to an effort by the government to shape public opinion on its own affairs, the Associated Press has always sought to protect and preserve its independent voice. At the time he organized the cooperative, Beach doubtless understood that the telegraph would remove some competition and duplication of effort among members. If the telegraph office limited each sender to 15 minutes, why would a newspaper’s agent wait in line to send a common digest of news when the next person was going to be sending the same thing? 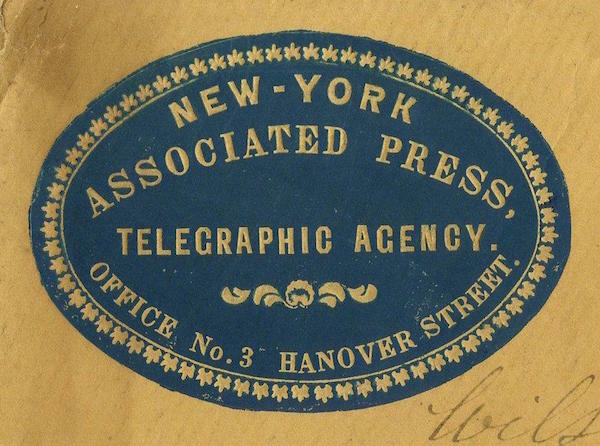 As the telegraph spread nationwide, AP established arrangements for selling telegraphic news and inviting American newspapers to share the cost of the service. Member newspapers exchanged their own local news with the New York-based organization for news from New York City, from across the nation, and from overseas. Earliest known version of the Associated Press logo, c.1849 to 1857. Translated into modern newsroom vernacular: get it first, but first get it right. In a few unfortunate cases, though, the AP’s dedication to accuracy did give way to haste, as when AP prematurely reported the successful D-Day landings and (years later) the death of Bob Hope, much to the confusion of the Germans and the bemusement of the comedian. The AP’s “down-the-middle” approach to the news was sometimes anathema to the government’s desire to spin events during the Civil War, but it gave news from the front a much greater reach. A century later, the same straight-news approach managed to offend both Northern and Southern publishers during the Civil Rights era. The archives are filled with the letters of outraged editors demanding AP retract or correct various stories. That AP editors patiently answered each letter in kind is remarkable. That AP continued to witness the violence from Atlanta, Birmingham, Montgomery, Selma, and Little Rock is one of its greatest achievements. The bedrock of this kind of journalism is the people’s right to know, the belief that public opinion matters, and that therefore the risks taken to inform the people are worth taking. As de Tocqueville observed, the only thing more powerful than the press is the people. is director of the Associated Press Corporate Archives, New York. *Photos courtesy of Associated Press Corporate Archives.